Q&A with Alyson Waters, translator from the French and managing editor of Yale French Studies. Alyson Waters’s translations from the French include works by Louis Aragon, René Belletto, Eric Chevillard, and Albert Cossery. She is the 2012 winner of the French-American Translation Award for her translation of Chevillard’s Prehistoric Times. Waters has received a National Endowment for the Arts Translation Fellowship, a PEN Translation Fund grant, and residency grants from the Centre National du Livre, the Villa Gillet, and the Banff International Literary Translation Centre. She teaches literary translation at New York University and Columbia University and is the managing editor of Yale French Studies. She lives in Brooklyn. Asymptote: Describe your current/most recent project. Why is it cool? What should we know about it? I love that “I wanted to say it, and I did.” There is no question that this is one of the most challenging books I’ve ever translated. In addition to all the temporal back and forth that one needs to follow, there are beautiful lyrical flights about Giono’s beloved landscape, and they give the reader (and the translator) a break from trying to figure out who the heck is speaking. I just finished reading Per Petterson’s It’s Fine by Me, translated by Don Bartlett. I loved the voice of the narrator, and Bartlett did a gorgeous job. What translated book/translation/highly accoladed book were you disappointed by? Honestly, I’m not extremely patient with books that disappoint me. I usually don’t finish them. I’ll be tarred and feathered for this, but I’m not, for example, a huge Bolaño fan. What author would you like to see more popular/translated in the first place? One of my favorite authors of all time, Pierre Autin-Grenier. I have translated his I am not a hero, which will be published by Red Dust next year. Nothing else of his has appeared in English to date, except some excerpts published in the wonderful Stonecutter. My dream is to see as much of his work as possible translated into English. And, frankly, I want to be the one to do a lot of it. I do plan on doing, also for Red Dust, two more of his books that form part of a trilogy, of which I am not a hero is the first volume. My friend and fellow translator Andrea Reece has also translated one of his books, and is looking for a publisher for it. Any takers out there? What’s your pet peeve about the translation/literary industry? The obvious one. Our work is underappreciated and underpaid. Did you ever hear anyone say to a doctor: “Well, we know, you tend to your patients because you love them”? I love what I do, but I should get paid fairly for it, and so should all my translator friends. My good friend (and fellow translator) Emmanuelle Ertel just gave me a book called Et tu n’es pas revenu by Marceline Loridan-Ivens, which I finished reading yesterday. It’s such a sad, moving book that as I was reading the first pages, my glasses filled with tears and I had to stop for a bit. It’s written by a Holocaust survivor and addressed to her father (the “tu” of the title) who did not “come back” from the camps. It’s very short and very powerful. The next book I plan to read is Per Petterson’s I Curse the River of Time. If you weren’t a translator, what would you be? A rock star, or miserable. What language do you wish you could speak/read? Almost all of them, but especially Hungarian. My father is Hungarian, but my sister and I never learned the language as children. I have tried at least four times as an adult, but it is an impossible language for anyone who didn’t grow up speaking it. I find it exceptionally beautiful. What should every young translator be able to do? 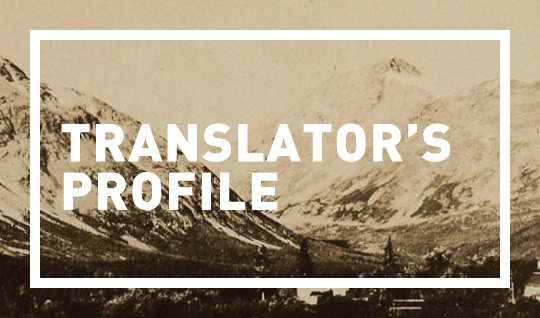 If you’d like a taste of Alyson Waters’s translation work, check out our recent Translation Tuesday, featuring the short story “Night Visit” by Emmanuel Bove.